It's apple season once again. We have a dwarf Granny Smith apple tree in the front yard and this year the squirrels bit pieces off of every single one. I bought loads of apples at the Public Market the other day and just had to make homemade applesauce. I've shared this recipe with you for the past 3 years & would like to share it again. It's delicious and nutritious. Eat it as your fruit, for breakfast with oats on top or as a healthy dessert: Warm Cinnamon Applesauce. It is so easy, tastes a thousand times better than store bought, and is healthy! 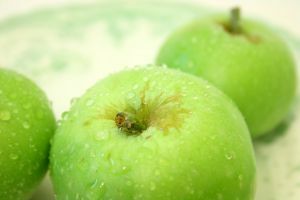 We usually buy our Granny Smith apples at Aman's Farm & Market, a local family-owned garden center, farmer's market and gift shop here in Irondequoit. I buy 3 pounds at a time in the fall. I prefer Granny Smith--you can use almost anything. Wash your apples, then peel and core them. Put a few at a time in a mini chopper, food processor, or chop by hand into small pieces.